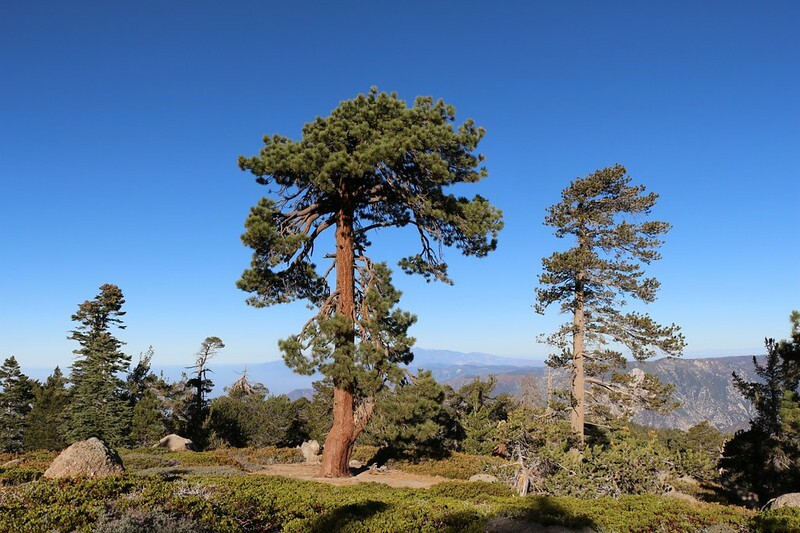 For this, my second attempt at backpacking solo, I chose to repeat a hike that Vicki and I had done several years ago, climbing San Bernardino Peak in the San Gorgonio Wilderness and camping at the Limber Pine Bench campsite. (Link) Of course, this time I was in much better shape, with much lighter gear, so I decided to hike all 3400 feet in one day, rather than breaking the climb into a two-day trip. I’d still spend two days, but this time on my second day I would take life easier, simply bagging the summit, relaxing up on top for a few hours. I would return on the third day. That was the original plan, at any rate. I left San Diego about 4AM, and arrived at the trailhead parking lot just before dawn. The lot was empty as it was a Friday, so I got a nice spot in the shade. A young couple arrived soon afterward, and I got them to take a photo of me, which solved at least one of the problems of solo hiking. Setting up the camera in time-delay mode is always troublesome, so I rarely do it, and I end up with very few photos of myself. I finished the final pack adjustments and put it on. 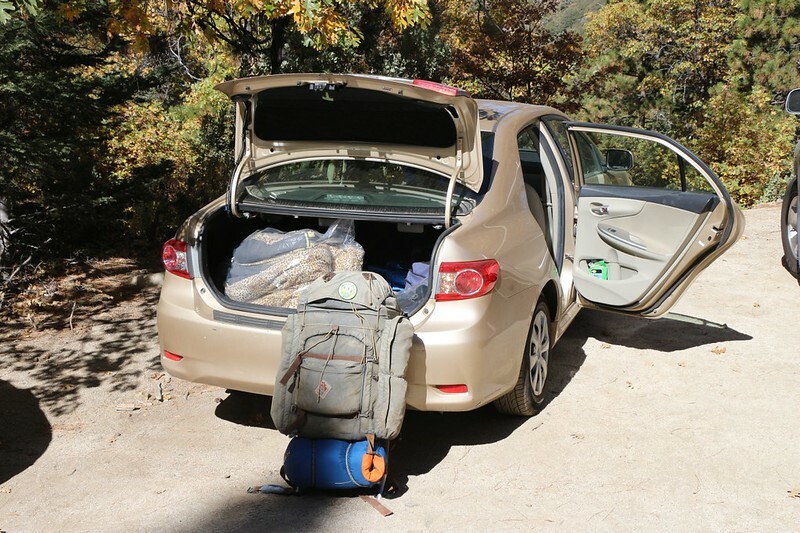 It weighed less than forty pounds, which was extremely light compared to the fifty-plus pounds I normally carry when hiking with Vicki. 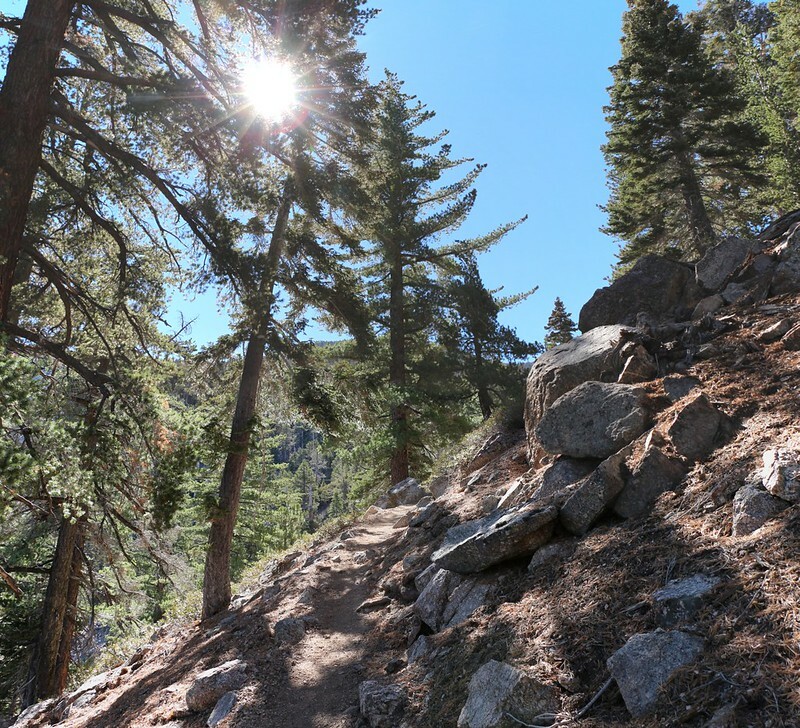 I didn’t exactly feel bouyant, but the climbing felt great as I headed up the trail. Fall was in the air. 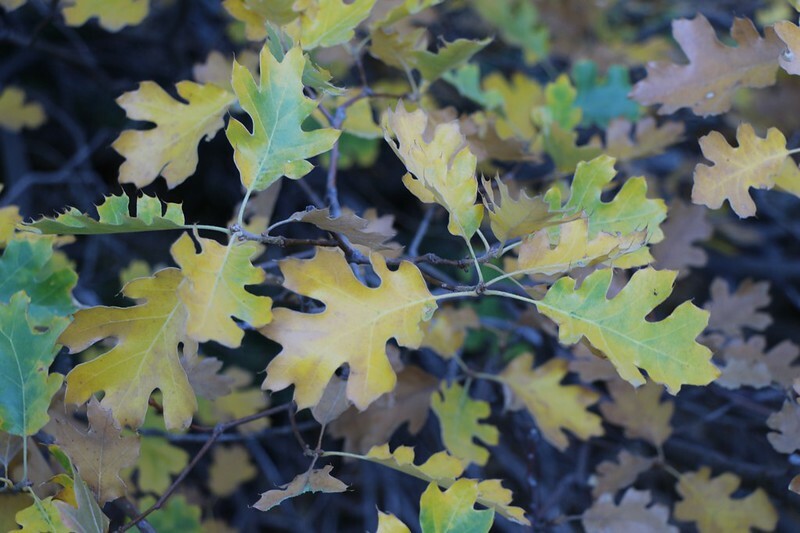 The pines were evergreen, as always, but the oaks were all changing to a lovely yellow color. Oak leaves littered the forest floor and crunched underfoot, releasing a pleasant Autumn fragrance. As I climbed yet higher, I came upon lofty viewpoints that looked out across all of Los Angeles. On a crisp Winter day the air would be clear and the view would stretch out over the Pacific Ocean, but not this weekend. LA was shrouded beneath the humid marine layer, and only distant mountains rose high enough to pierce the clouds. Soon enough, the first main set of switchbacks were over, and the views got even better. I had reached the “Manzanita Flat” section, which was dominated by chaparral. 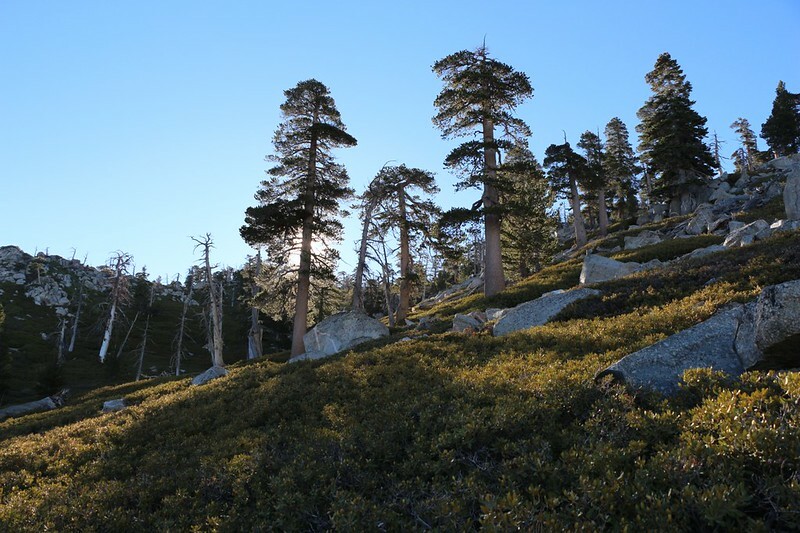 Here the oaks had been left behind at lower elevations and the pines were scattered. Gooseberry bushes provided the fall color. 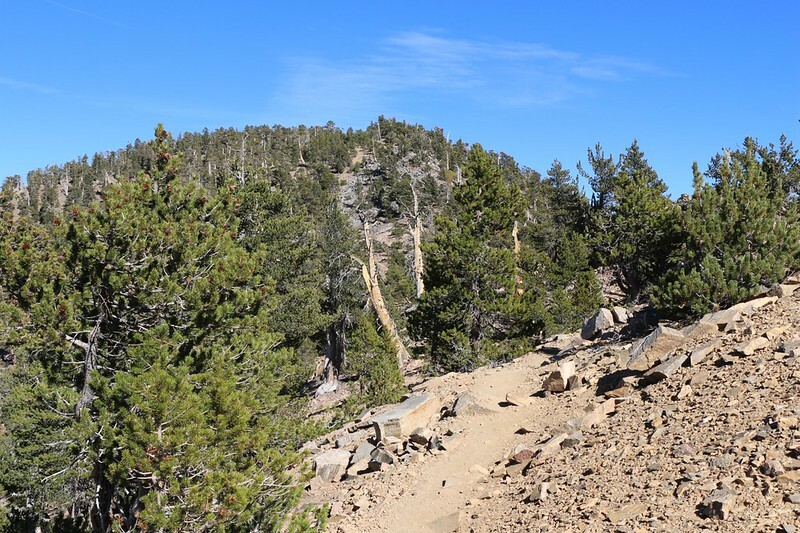 It was sunny, but the temperature was perfect for hiking, and the slope of the trail had eased as it followed a long ridge toward San Bernardino Peak. 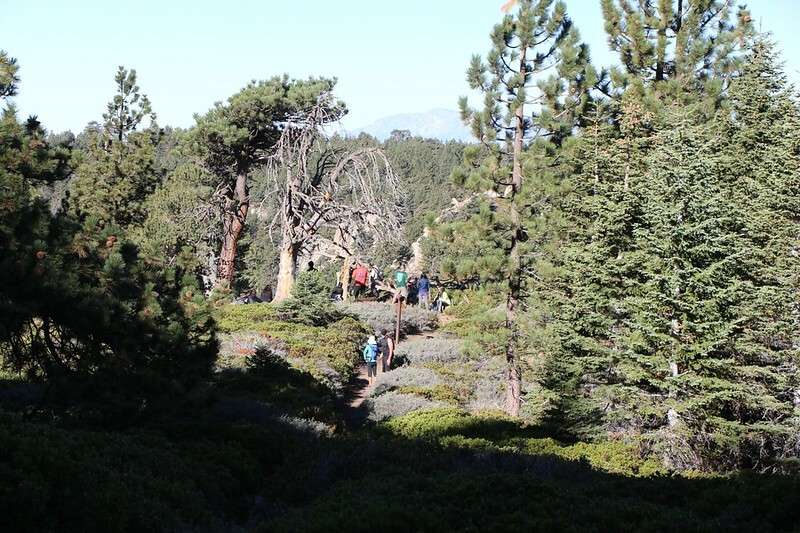 This section ended at the junction with the Johns Meadow Trail, and then began to climb steeply through a pine forest once more. The gooseberry bushes were gone, but in their place were willows, which lived down in the dry ravines and watercourses. They thrive in the Spring, thanks to plenty of melting snow, which lasts longer on this north-facing slope. A thousand feet of climbing later and I was finished with the day’s hike. And it wasn’t even noon! 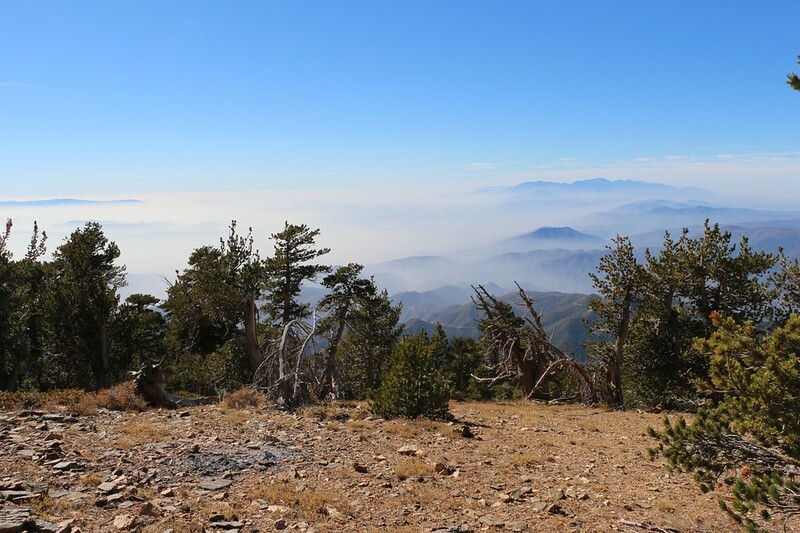 I had arrived at Limber Pine Bench, a large backpacker’s campsite up on an exposed ridge with striking views all around. 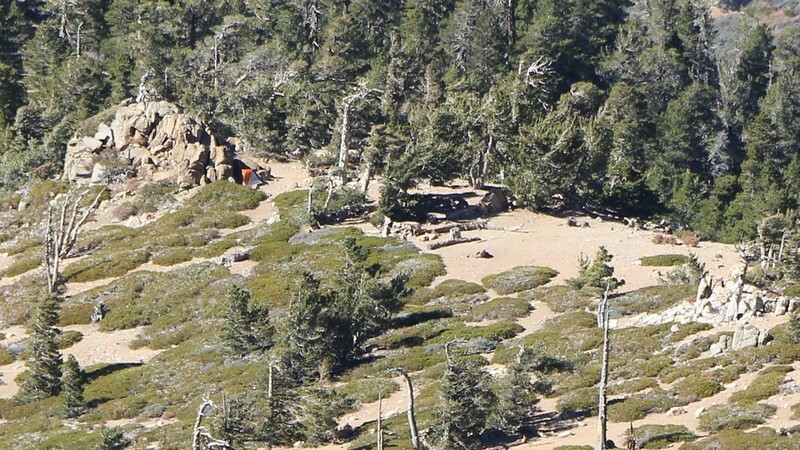 The downside of an exposed ridge is that it is particularly subject to the effects of wind, and the weather this weekend had been predicted to be breezy, with 25 mile per hour gusts out of the west. Luckily, many others had camped here before me, and they had built low walls of rock and logs around small flat spots suitable for a tent. The walls weren’t perfect, but they’d be enough to keep your tent from being completely flattened by an extra-strong gust. Since it was a Friday, I had the entire campsite to myself! I wandered along the ridge, trying to decide which shelter was best. And the weatherman was correct: It was, indeed, breezy and gusty. And predicted to get stronger by evening. I ended up finding a nice spot behind a large boulder down at the far end of the campsite. If other people arrived, I would still have some privacy, as nobody would be walking past my spot. Perfect! 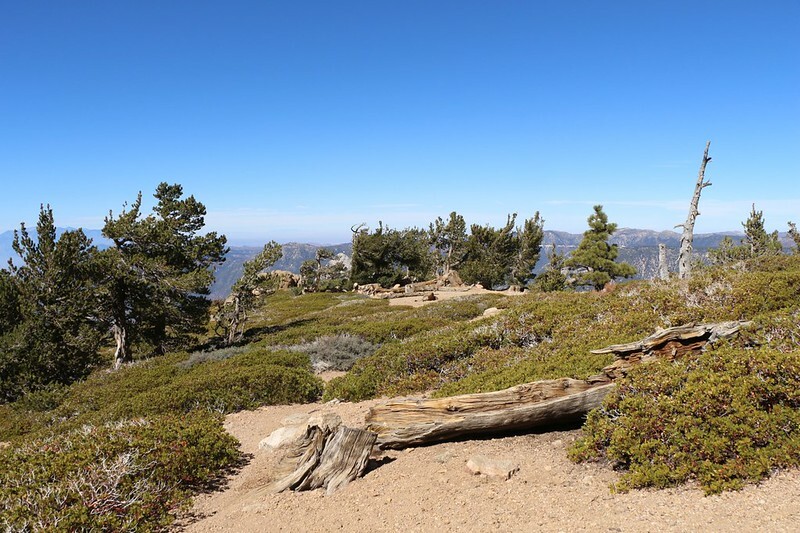 View north along the ridge at Limber Pine Bench. I set up camp at the far end. I set up the tent, blew up my air mattress, and laid out my sleeping bag. There were only occasional gusts of wind swirling past the big boulder, and I was satisfied that I would have a relatively peaceful night. 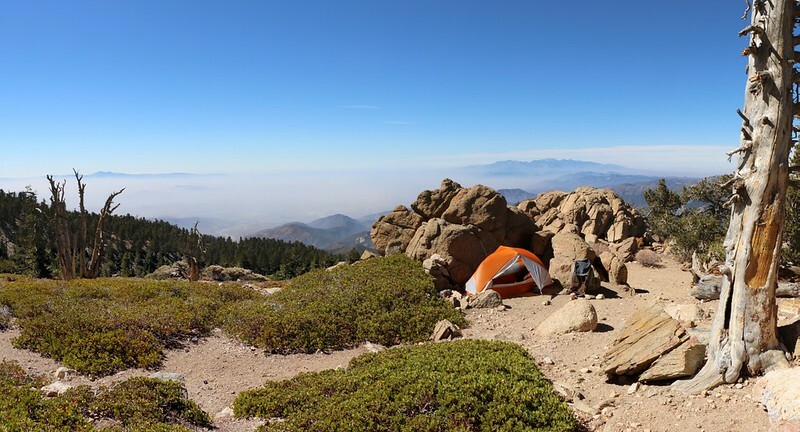 Sleeping is difficult in a tent that is buffeting all over the place; it’s loud and sometimes the wall of the tent can get pushed sideways into your face. Not fun at all. I took a short nap, but it was a bit too bright and hot under the thin nylon in the noontime sun. Also, I wasn’t sure what I would do for the rest of the afternoon. My plan was to stay two nights, climbing the peak the next day, and returning to the car on Sunday. I sat up in the tent, bored silly, and decided to change the plan: I would climb the peak today! I still felt great, my legs were strong, and I had plenty of time. I’d hike back down to the car tomorrow. That would make Vicki happy, and also made sense in terms of the weather forecast, which predicted even higher winds and possible rain, or even snow up at this elevation. Purposely staying in order to suffer through brutal conditions was something I might have done as a younger man, back when I was single, but it didn’t seem all that wise right now. I was out here solo. Having a buddy around (like Vicki) might have changed my mind and made me welcome a suffer-fest. So I emptied my big pack and refilled it with the ten essentials. I also brought the water filter and a gallon jug, but I planned to filter the water on the way back down. 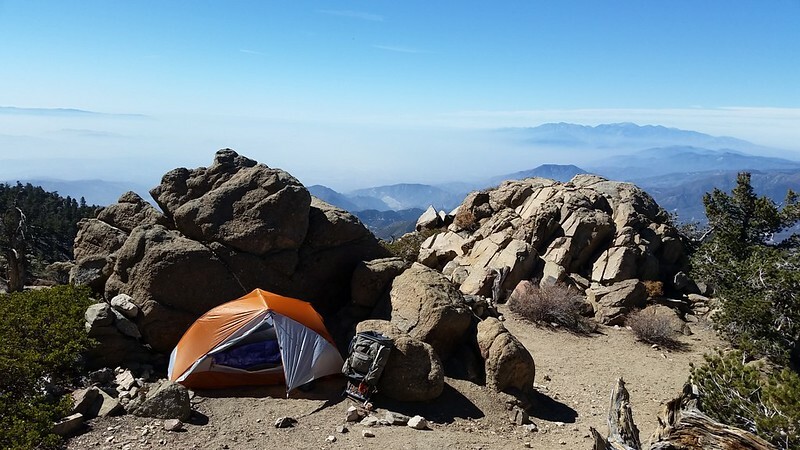 I zipped up the tent and started hiking uphill. 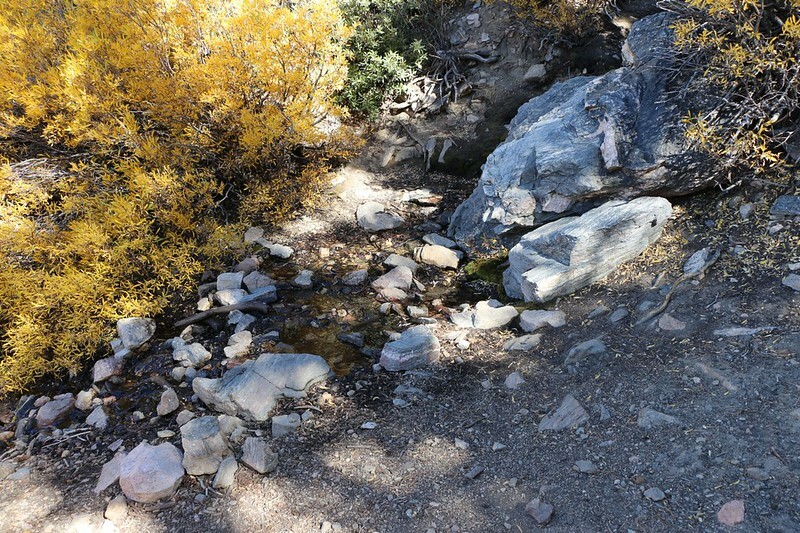 Less than a half mile from camp was Limber Pine Bench Spring, a very reliable source of water. It was flowing well, even this late in a fairly dry year. I continued onward, switchbacking upward above the main camp. I could see my tent down below, out on the end of the ridge. A mile or so later I reached the Washington Monument (no, not that Washington Monument), which was created in 1852 to serve as the San Bernardino Meridian, to establish the Initial Point and Baseline for all surveys and maps in Southern California. I looked to the west, where I already knew that Baseline Road extended below me for miles and miles. But this time I was thwarted by all that low-lying haze. I could barely make it out! Oh, well. 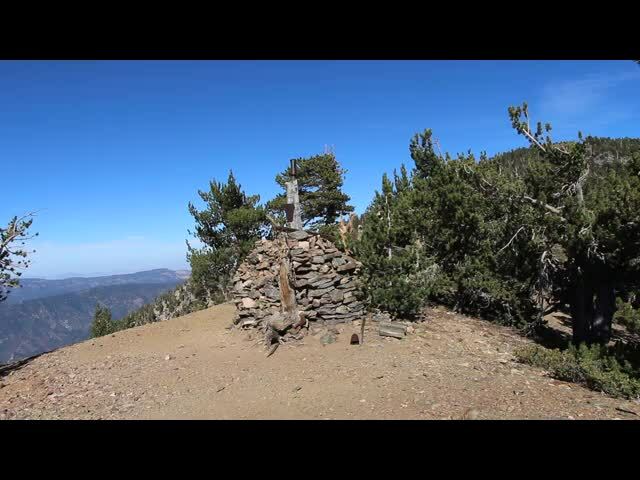 That probably happened to the surveyors way back then, as well, when they would light big bonfires up here on the mountain as their low-elevation colleagues aimed their transits at the bright light so high and far away. 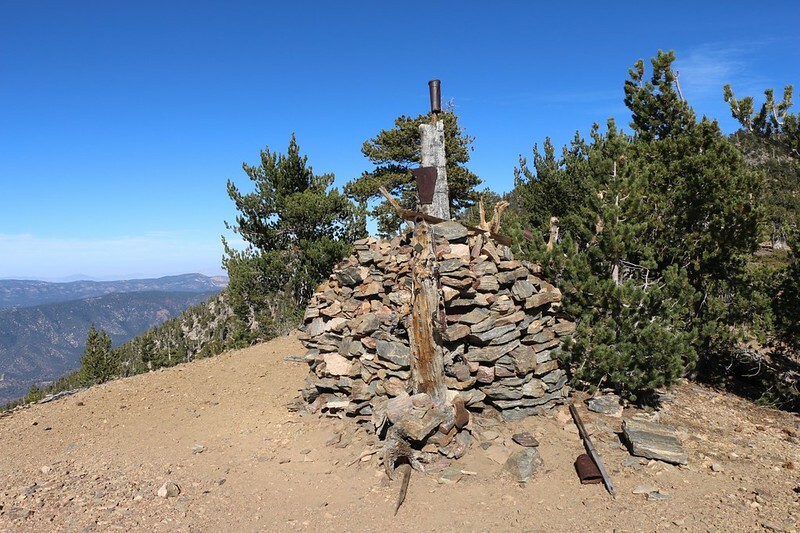 Indeed, even today, there are countless hiking trips made by modern surveyors to this location, and many small metal markers have been nailed to the old wooden boards that jut from the stony cairn, in homage to the surveyors of old. 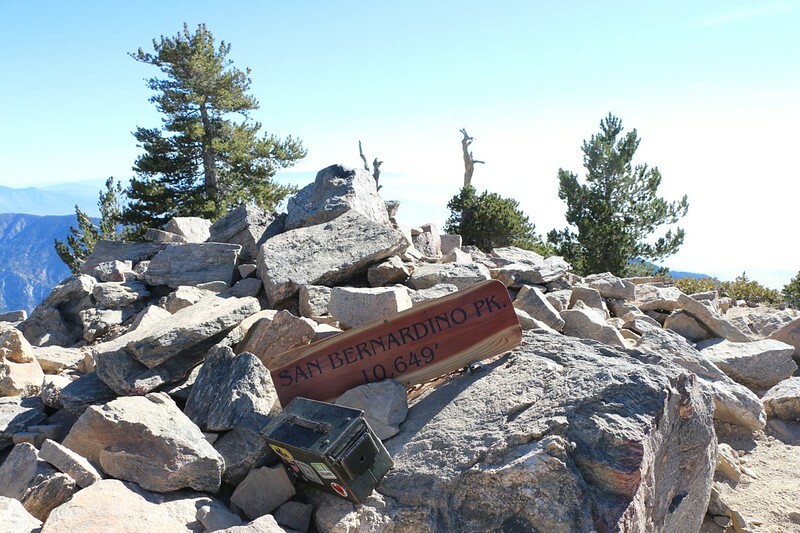 After that, it was time to bag San Bernardino Peak, elevation 10,649 feet. It was an easy hike from the monument to the summit, only climbing a few hundred additional feet. I stood on top of the summit and admired the view. I signed the summit register and checked out the brand-new wooden summit sign. I had just met the man who placed it there as he headed back down, thus making me one of the first people to photograph it in its new location. 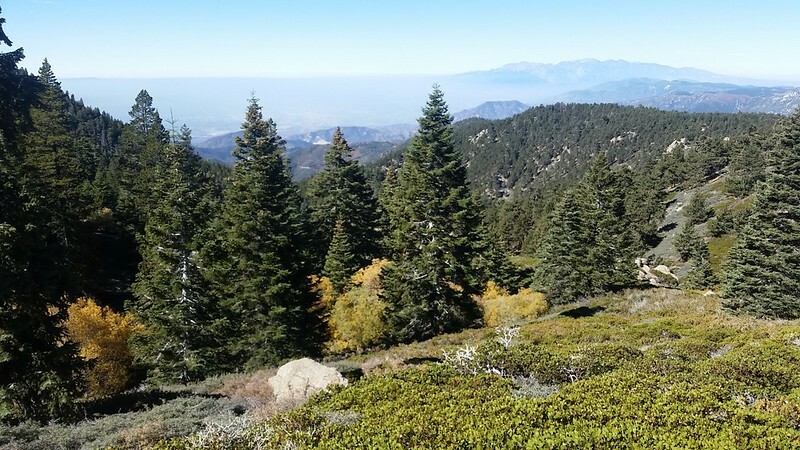 My original plan for Day 2 was to include a longer hike to San Bernardino East Peak, another mile or so away, but the new revised plan did away with that goal. I simply didn’t have time. And probably not enough energy. 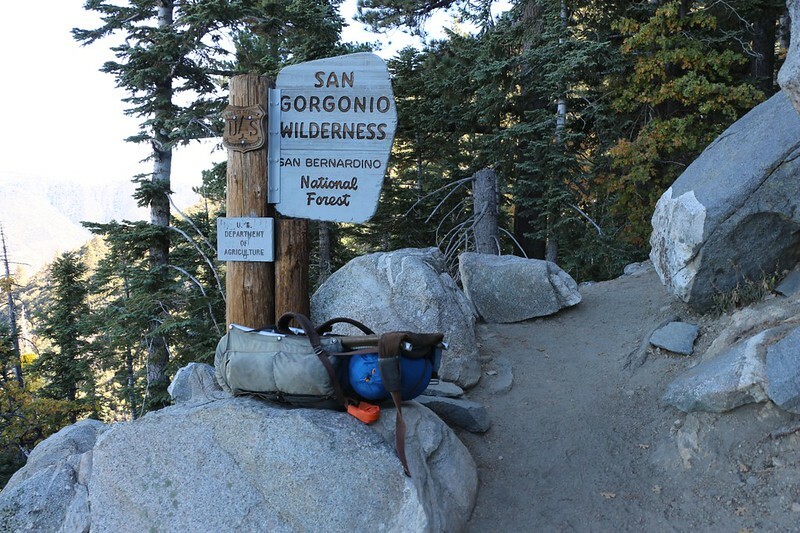 I had already climbed over 5000 feet in one day, most of it with a full backpack, and adding another thousand or so onto that total seemed like more than I really felt like doing. So I waved at the peak, then turned around and headed down (at an enjoyably fast pace) to the campsite. Along the way, I met a couple more hikers, and also stopped to pump a gallon or so of water at the spring. It was icy cold, and my hands were getting frozen, what with the repeated wetness and the gusty winds blowing them dry. Sitting around at the spring didn’t help my core temperature either, and I was feeling chilled, so I descended the trail below the camp for a bit and climbed back uphill to help warm up my blood. On the way to the tent I saw that I had a neighbor. He had a tarp strung up behind one of the rocky walls, and it was waving around in the wind. I hoped for his sake that he had a warm sleeping bag, as he wasn’t very well protected from the breeze. 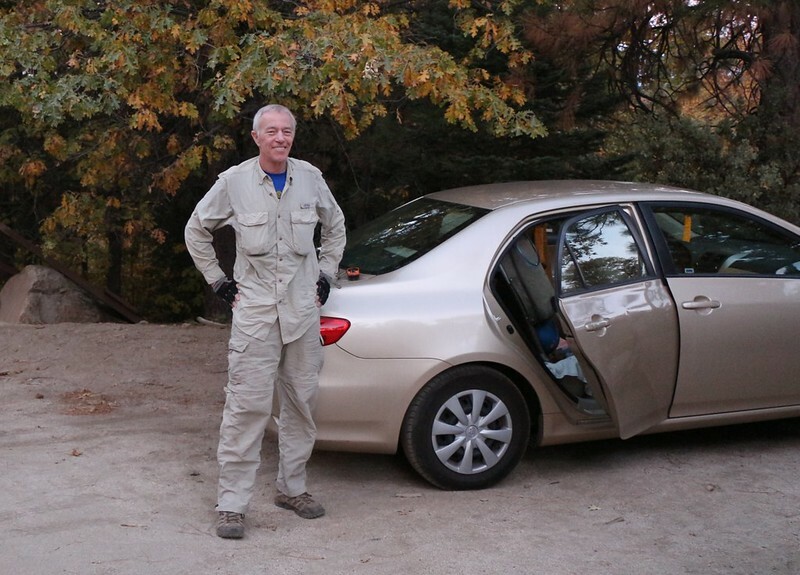 When I got back to camp I immediately changed into my extra-layer night clothing, and kept my legs in the sleeping bag as I heated some water in the vestibule of the tent. I made some hot chicken broth using a flavor packet from some ramen noodles, and felt the warmth in my core as I sipped it. Ahhh! Unfortunately, I wasn’t feeling particularly hungry, possibly due to the altitude and the day’s exertions, so I didn’t bother making any dinner. But I still forced myself to drink extra water and eat some salty chips to help replenish my fluids and electrolytes. I ate a few Skittles for dessert and called it a day, even though it was still light outside. During the night the winds were gusty, but it wasn’t too bad hunkered down next to my large protective boulder. I woke up a few times due to the noise of the tent shaking, and decided to go outside for a look-see. I pulled on several extra layers, checked out the view, then came back and grabbed my camera. 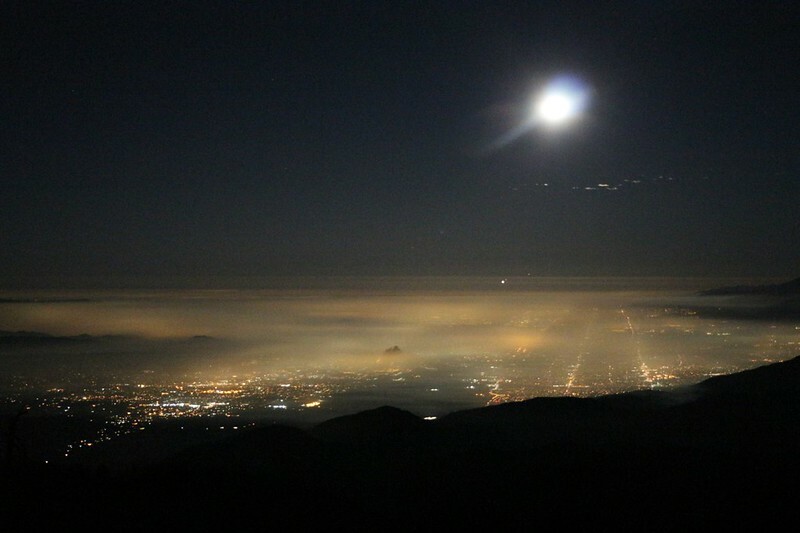 The lights of LA were glowing under the clouds and the full moon. This time I was able to see Baseline Road running west, although I was a bit north of the meridian here at camp. I wandered around the campground, since I was wide awake, but the incessant wind drove me back to the tent for shelter. It was cold out there! I wondered how my neighbor was doing; I figured that he was frozen and shivering, but hoped that he was toasty. 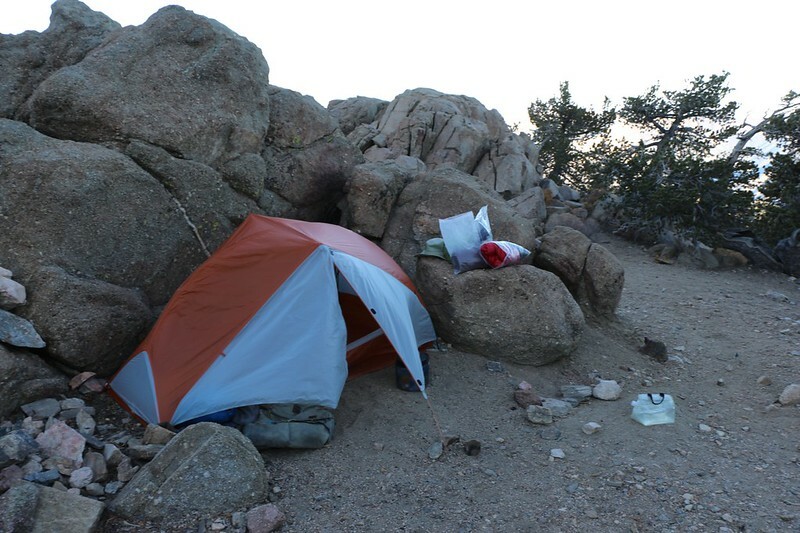 I didn’t hear his teeth chattering over the noise of the wind, so I zipped up the tent and snuggled into my warm spot. I read a book by headlamp, with only my gloved hand sticking out of the sleeping bag, until I grew tired again and slept some more. Just the same, I woke up at first light and began heating water for my usual hot chocolate/coffee combo drink. I drank it sitting up in the sleeping bag. Then I began packing and organizing everything in the tent. It was cold and breezy and the sun was hours away from striking the tent. Eventually I realized that the only thing left to pack was the sleeping bag, so I took my legs out. Brrr! I changed into my hiking pants and stuck them back in to heat them up a bit. Then I bit the bullet and left the bag for good. Cramming all that goose down into the stuff sack was enough exercise to get me warmed up. Then it was time to pack the tent, always a fun job when it’s windy. But I was an old hand at this by now. I finished packing and poured out the extra water onto a couple of deserving trees near my tent. They were on the upwind side and I wanted them to grow strong, with luxurient foliage, to better block the wind for future campers. Then I put on my pack and started hiking. On the way out, I noticed that my neighbor was already gone. With that wimpy tarp of his there was no real point in staying any longer, as he might as well have been outside. The way down was fast and uneventful. The sky was clear, the sun was shining, the air was cool and breezy. Fine hiking weather, in other words. I reached the intersection with the John’s Meadow Trail in no time at all, it seemed. And that was also when I began meeting all of the weekend day-hikers. Yesterday (Friday) the trail was nearly deserted, but not today. Everyone wanted to know how my night had been, and my reply invariably was “Windy.” I asked about my neighbor, and found out that he was long gone, and I never did meet up with him at the trailhead. Even though I was hiking fast, it still took me a few hours. 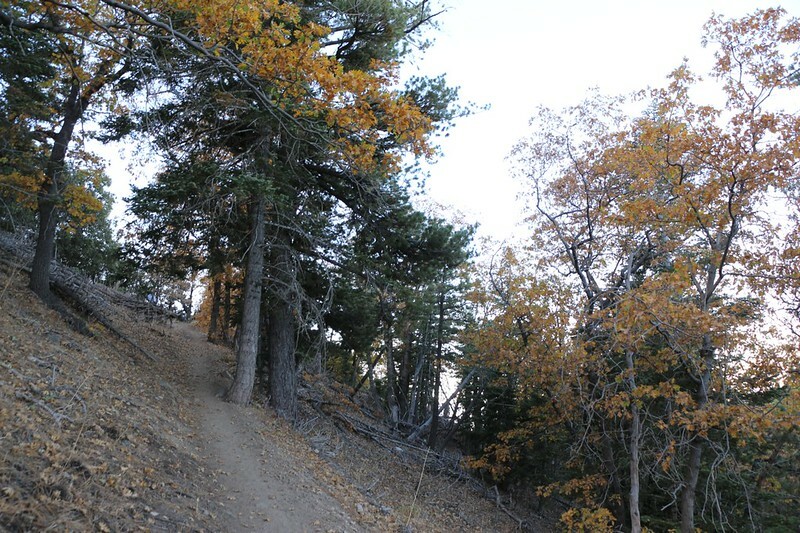 I enjoyed the stroll along Manzanita Flat, and smiled at the colorful Autumn oaks on the final set of switchbacks. Part way down my pack’s belt suddenly detached from the frame on one side. The load felt rather lopsided! I hiked a bit further until I found a large boulder suitable for backpack repair. Upon inspection, I was relieved to discover that it was only a metal ring that had popped off a pin. Luckily, I had a spare handy, and I was soon cruising downhill again. Hiking the rest of the way with nearly all of the weight on my shoulders would have been miserable. When I got the the parking lot I found that it was absolutely packed with cars! A far cry from when I had been the only one the day before, at dawn. I put my pack down, then sat in the passenger seat and drank a can of soda that I had stashed in the trunk. I changed out of my sweaty shoes and socks. I also ate some of the extra snack that I had carried all that way but didn’t eat due to cutting my trip short by a day. I called Vicki on the phone and told her that I would be home in a few hours, then drove away. Three hours later and I was home.